Allowing women the right to vote! a commemorative medallion that can be worn as a necklace. A limited edition will also be struck in one ounce .999 fine silver. An open contest for the design is now on! Deadline is Monday August 19th 2019.
with five runners up receiving additional cash prizes. The winning designs will be announced on Monday Sept 30 30th, 2019. - with a bonus tour through the Philadelphia Mint! The artists will be honored by their appearance at this gala event. The event will include speeches and live music. 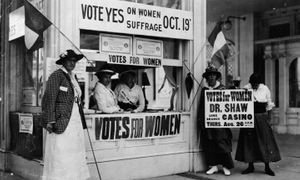 detailing the history of women's suffrage in The United States. Additional designs will be put up on this page to be voted on. ENTER YOUR SUBMISSIONS NOW!! !